A group of five hillwalkers has been rescued from the Cheviot Hills after becoming trapped by floodwaters. Two of the group - all from Edinburgh and East Lothian - had heart conditions and had run out of medication. The Borders Search and Rescue Unit was called out at 1930 BST on Saturday to the incident in the Bowmont Valley above Yetholm in the Borders. 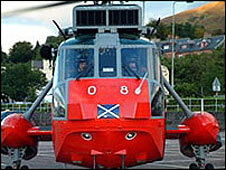 A Royal Navy helicopter helped to take the walkers to Edinburgh Royal Infirmary for treatment. The five walkers were staying in the Auchope Bothy at the top end of the valley when they got into difficulties. They were unable to get out of the area due to "massive flooding". A spokesman for Border Search and Rescue Unit said it had struggled through "extremely poor" weather conditions to get to the group. "Members of the team struggled through very testing conditions for some distance over the hilltops to reach Auchope Bothy," he said. "A Royal Navy rescue helicopter from HMS Gannet at Prestwick managed to struggle through very difficult flying conditions. "Working closely with the helicopter all five were safely evacuated to the Edinburgh Royal Infirmary - conditions would not allow the helicopter to fly to the Borders General Hospital at Melrose." The rescue team then faced the "difficult task" of getting back to safety themselves. They eventually made it back to Kelso at 0300 BST on Sunday.